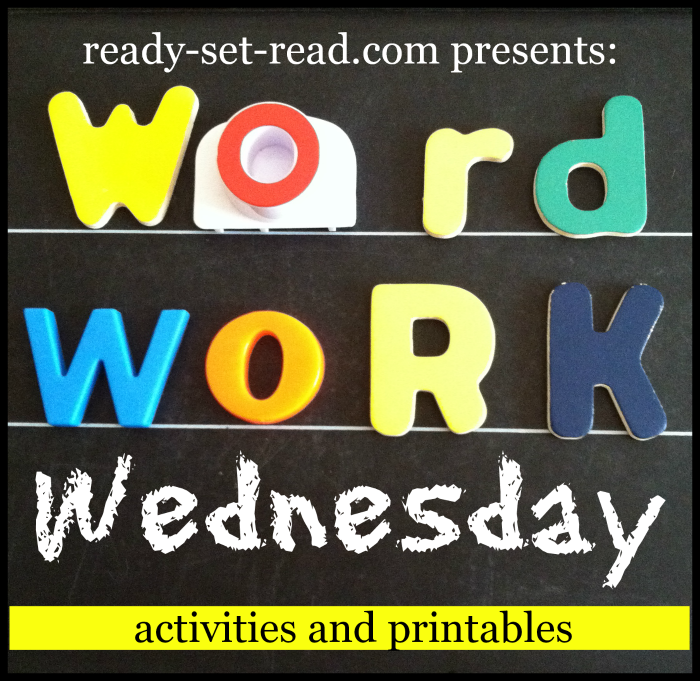 Ready-Set-Read: What is word work? 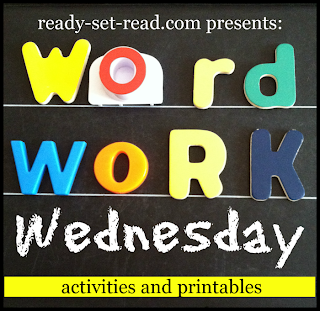 Each Wednesday on Ready-Set-Read, I am hosting "Word Work Wednesday". I'll be sharing informative articles on word work and offering resources to use during word work with early readers. Word work is a popular component of most early literacy programs. Parents may see the term on a daily schedule for an elementary school class. Teachers may plan it in as one component of the Daily 5 reading program or other program that is being used in class. However, you may still be wondering "what is word work?" Today I'm going to give the basics of word work. I'll offer some examples of word work for early readers in this post. You can find more examples of word work on my Word Study Pinterest board. I'd love if you'd follow while you are there! Word work is the time when children have an opportunity to work with words (and letters). This will look different in different classrooms. There are components of phonics, sight words, and spelling. The goal of word work is to learn how words work. Word work is a short period of the literacy instruction time. It should be transfered to the reading and writing component of the lesson. Word work allows children to work to understand patterns in words. It allows children to progress on their own level. Word work is different than just spelling, although spelling is one part of word work. When a child learns to spell a set of words, he or she acquires item knowledge. In spelling, you can say, "My child can spell 50 words correctly." Word work is not about acquiring a list of words, but learning how words work. In word study, children sort words by common attributes. They study word patterns. They break words into parts. When children transfer the knowledge from word work to reading and writing, they build reading and writing skills more quickly. Here is an example of word work with short e word families. Children can sort the words under the correct category. As they sort and read, the children will be able to notice patterns in words. 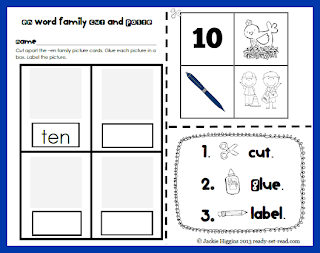 These printables are a part of my short e word work pack. Word study doesn't have to be lengthy to be effective. Children can complete a quick letter or word sort in about 5-10 minutes. That word study lesson can be revisited in the child's reading and writing. A child may sort words that rhyme with cat and words that do not rhyme with pet. The child is learning something about onset and rime during the sort. Later in reading and writing, the child will have opportunities to break words into onsets and rimes to decode them or write them independently. The child will draw on the skills learned in word work. The teacher can help coach the child to bring that strategy to mind. Even if the word isn't from the "-et family", the child has still learned a lesson in word work time that will work many other words. Children can transfer this knowledge to writing sorts as well as reading sorts to help make the connection to writing stronger. Here are a few examples of written word sorts and cut and paste activities that involve writing. 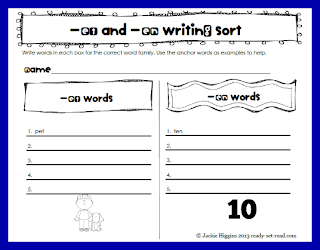 These worksheets are included in my short e word work pack. Word work is not about memorizing a set of words that follow a pattern. Word work is about understanding the pattern. Some children will need lots of practice to master a particular word pattern, other children will be introduced to the concept and begin to notice it in many words. Many children do not need to study every single CVC word in every single word family. Some readers will be introduced to the pattern in the word through word sorts, and will begin to understand. 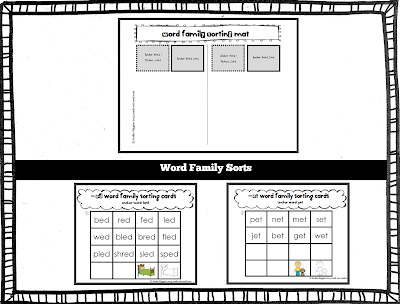 Other children will need to do multiple sorts on many word families to grasp the concept. Word work needs to be differentiated to meet the needs of the individual learner. During word work, children are working with some words they know and gradually adding new words. This provides a sense of confidence for all levels of readers. Word work is best when it is hands on. Children can manipulate letters or word cards. They can build words out of letter tiles. They can draw and write about words. They can play games with words. Here is a fun game for the short e word family. Children race to 15 to read words that follow the pattern of CVC.